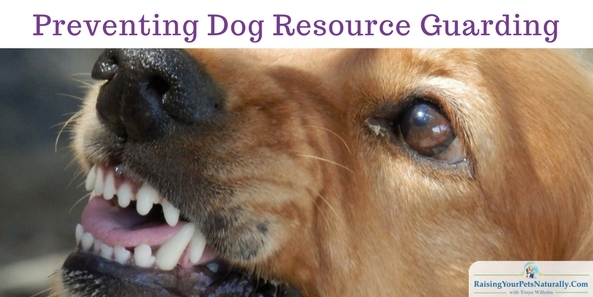 Preventing Resource Guarding In Dogs A very common and natural behavior in dogs is resource guarding. Resource guarding is a term commonly used to refer to a dog that uses threats to protect items that he sees as valuable. 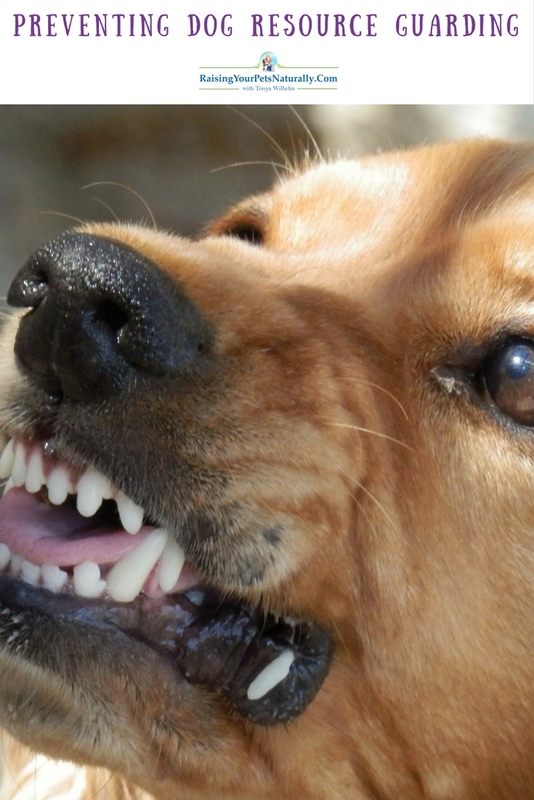 Dogs can deem any item, location, space, or person as a valuable possession worth fighting for. Resource guarding is a survival instinct and once again a normal dog behavior but not something we want to see in our pet dogs. You are best served to work on a prevention program instead of trying to deal with a behavior that can be very severe and even life-threatening. Today we are going to talk about preventing resource guarding around the dog bowl. The Dog Food Bowl You will be teaching your puppy that not only is it okay for a person to approach while he is eating out of his food bowl, but that it is a very good thing when they do. Of course, I am hoping you are using your puppy’s food for training and interactive treat toys, and not truly using his food bowl as a means of feeding. But, it is still important to teach prevention with a dog food bowl in the event that your dog actually eats out of a boring dog dish instead of training games and interactive treat toys. Approach the empty dog food bowl and your puppy. Put a small handful of his dog food in the bowl and allow your puppy to eat the food. As he is eating, add another handful of kibbles (dog food). Practice this session once a day for three days. Approach the empty dog food bowl and your puppy. Remove the bowl, put a handful of dog food in, put the bowl back down and allow your puppy to eat the food. Before he is finished, put your hand inside the food bowl and drop three high-value treats (100% meat treats or cooked meat) inside the bowl and remove your hand. Practice this session once a day for three days. Approach the empty dog food bowl and puppy, remove the bowl, put a handful of food in, put the bowl back down and allow your puppy to eat the food. Before he is finished, pick up the bowl, add more kibbles and a few pieces of meat treats in the bowl then set back down for him to eat. Practice this session once a day for three days. Approach the empty dog food bowl and puppy, put the entire meal of food in the bowl, put the bowl back down and allow your puppy to eat the food. Before he is finished, place a handful of meat treats inside of his bowl. Practice this session once a day for three days. Approach the empty dog food bowl and puppy, put the entire meal of food in the bowl, put the bowl back down and allow your puppy to eat the food. Leave the room, come back into the room before he is finished eating and pick up the bowl and place a handful of meat treats inside his bowl and place the bowl back down. Practice this session once a day for three days. After your three days, repeat this process every other day for a week, then once a week for his entire life to keep the behavior and reaction strong. Start each exercise over with a new adult doing the exercises, providing no aggression or guarding has occurred. Resource guarding is a behavior that can occur at any age, at any time. Therefore, it is essential to work on prevention throughout your puppy’s life through old age. If you have small children, it is critical teach them at an early age not to bother the puppy while he is chewing, eating, or sleeping. Do not allow children to see you perform these exercises, as kids tend to do as they see, not as they are told. If you ever see your puppy stiffen up, growl, snap, or lunge around resources, stop your exercises and seek professional help immediately. Do not attempt these lessons without professional assistance if you are seeing signs of guarding. A good resource for resource guarding is Jean Donaldson’s book Mine!